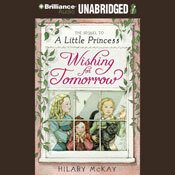 I just finished listening to Wishing for Tomorrow by Hilary McKay, narrated by Justine Eyre. This is an audio book I received through the Amazon Vine program. I didn’t know it was an audio book when I requested it, but I am glad I gave it a shot. My full review will appear on Amazon, but I wanted to highly recommend it to my readers here. This is a sequel to A Little Princess by Frances Hodgson Burnett. McKay was captivated by this story of a group of young girls at Miss Minchin’s Select Seminary for Young Ladies when she was a girl and used that book as a basis for her story. A Little Princess centers around a young girl named Sara Crewe, who is living a life of privilege, until her father, Captain Crewe, dies penniless in India. Sara now works for the mean Miss Minchin as a scullery maid and is forced to live up in the attic, but she says she can still be a princess inside. Then one day, a mysterious man from next door changes Sara’s world forever. Wishing for Tomorrow is the story of the girls left behind at Miss Minchin’s after Sara leaves with the mysterious man from next door. Ermengarde struggles now that her best friend, Sara, is gone. Lavinia is leader of the girls again and dreams of a more interesting life. Lottie gets into all kinds of mischief. And the new maid, Alice, is a welcome addition to Miss Minchin’s, even if her standards aren’t quite up to what Sara’s used to be. I have not read A Little Princess, so I don’t know how closely McKay followed Burnett’s original creation when she wrote about Ermengarde, Lavinia, Lottie, Jessica, and Gertrude, but this is a moving story. One that I will certainly listen to again. As I might have mentioned before, I am currently at work on a middle grade novel about Amelia, a young orphan girl who is sent to live with her miserable spinister aunt. I requested Wishing for Tomorrow because Amelia will be spending part of her time at Wheaton Female Seminary (now Wheaton College), and I wanted to get a feel for some of the things Amelia might have experienced. Having never gone away to college or off to boarding school, I needed to find a way to make Amelia’s experiences real for the reader. While I reviewed the audio version of this book, Wishing for Tomorrow is also available as a hardcover.